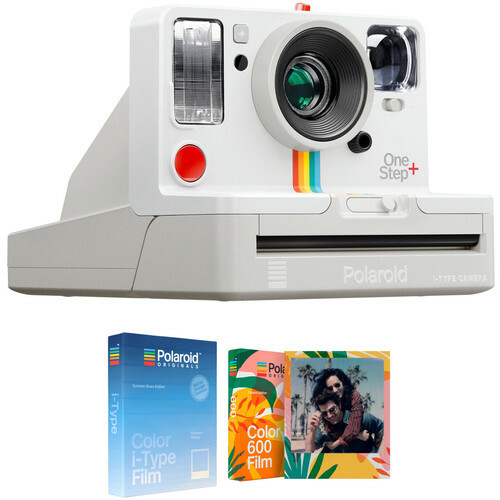 Comprising everything you need to get started, the Polaroid Originals OneStep+ Instant Film Camera with Summer Blues and Tropics Edition Film Kit from B&H bundles the uniquely connected camera with one pack of Summer Blues Edition film and one pack of Tropics Edition film. Based on the original Polaroid OneStep from 1977, the white OneStep+ from Polaroid Originals reïmagines the classic instant film camera by using Bluetooth to offer mobile device compatibility and expand its creative potential. Designed to be simple and easy to use, this camera accepts both i-Type and 600 instant films to produce 3.1 x 3.1" prints, and has true point and shoot functionality. The OneStep+ integrates with an iOS or Android mobile device with the Polaroid Originals app installed, which can activate the camera's remote trigger, noise trigger, or manual mode, as well as the ability to make double exposures or light paintings. The form factor of the OneStep+ recalls its predecessor, but has an updated polycarbonate shell along with an optical viewfinder, built-in flash, and a familiar bright red shutter release as well as self-timer function. The fixed 106mm lens offers a comfortable field of view for everyday shooting, and its fixed focus design suits photographing subjects as close as 2' away, or 1' away when its portrait setting is engaged. Powering the camera is a built-in 1100mAh lithium-ion battery pack, which is rated for up to 60-days of use per charge. Bluetooth-compatible to integrate with an iOS or Android mobile device with the Polaroid Originals app installed. Polaroid Originals app can be used to enable remote trigger, noise trigger, or manual mode, as well as the ability to make double exposures or light paintings. Fixed 106mm, f/14 to f/64 lens is constructed from optical grade, coated acrylic and has a fixed-focus design for working with subjects as close as 2' away, or 1' away with its portrait setting enabled. 12 second self-timer function is ideal for selfies and group portraits, which can be reduced to 1 second using the Polaroid Originals app. Built-in 1100mAh lithium-ion battery can last for up to 60 days per charge, and is charged through the camera with an included USB cable. Neck strap for hands-free carrying. This pack of Summer Blues Edition Color i-Type Instant Film from Polaroid Originals contains eight sheets of film for use with i-Type cameras. Producing natural, yet vibrant colors, this ISO 640 film offers a classic instant film look with its glossy 3.1 x 3.1" image area, and mixes it up with stylish and unique blue gradient borders. Each shot develops in 10-15 minutes after exposure, and the film should be stored in a cool, refrigerated, but not frozen, place before use. Additionally, this film does not have a built-in battery and must be used with Polaroid Originals or Impossible cameras featuring their own internal battery. This pack of Tropics edition Color 600 Instant Film from Polaroid Originals contains eight sheets of film for use with Polaroid 600-series cameras. Producing natural, yet vibrant colors, this ISO 640 film offers a classic instant film look with its glossy 3.1 x 3.1" image area and mixes it up with assorted summery, tropical-themed borders. Each shot develops in 10-15 minutes after exposure. The film should be stored in a cool, refrigerated but not frozen, place before use. Additionally, even though this film features a built-in battery to power 600-series cameras, it can also be used with i-Type cameras that feature their own camera battery. Box Dimensions (LxWxH) 6.35 x 5.0 x 4.25"